An overlong, undercooked tale of hara-kiri and heroism on the high seas. In the last days of WWII, the Japanese naval command targeted the US aircraft carrier Franklin for destruction at whatever cost, although the planners of that attack surely must have known that the attempt would not stem their defeat. On March 19, 1945, a Japanese bomber eluded American air cover and crashed through the carrier’s flight deck, setting the ship’s stores of fuel and ammunition afire. 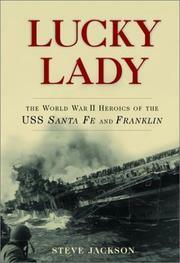 While swarms of kamikaze planes assembled to finish off the stricken carrier, the captain of the light cruiser Santa Fe—on which Denver-based writer Jackson’s father served—steered his ship alongside the badly listing Franklin, tied on lines, and began the perilous task of rescuing hundreds of surviving sailors while its firefighters joined those aboard the Franklin to extinguish the blaze. The Franklin survived, though some of its evacuees would be treated as pariahs for leaving the ship when no order to abandon it had been issued. Jackson covers the dramatic incident and its aftermath well, though he has a tendency to write in a tired war-correspondentese: “Everywhere he looked there were heroes. And maybe more importantly, everywhere he looked there were guys just doing what needed to be done.” “Still, there was nothing to do but roll with the punches and hit back.” “I’m writing the old lady today, ‘Drop them skivvies, honey, I’m coming home.’ ” Jackson devotes much space to portraits of the ordinary (very ordinary) joes who manned the ship—the farmboy from Missouri, the wisecracking big-city boy, the hot-dog pilot, “dark-haired and rakishly handsome, a cigarette dangling from his lips almost constantly.” These portraits never extend beyond the expected and add up to a second-tier Ambrosian celebration of heroism under fire—a bravery that is genuine and does not beg assertion after assertion. For veterans and their kin, perhaps, though general readers would do better to turn to Doug Stanton’s In Harm’s Way (2001) for a satisfying ration of WWII naval combat.